After a year of turmoil within the ranks of the International Federation of Football (FIFA), 2015 came to a conclusion for the giant sporting organization. The Ballon d’Or celebrations on January 1th rewarded the best players, coaches and moments that shined on the world’s biggest footballing stage this past year. Heading into 2016, charges of corruption against FIFA left some doubts in the minds of soccer supporters regarding the organization’s inner workings. But the football at the center of it all took center stage this week as the awards ceremony honored those who took the calendar year by storm, best representing their respective nations and teams. The most famous and arguably most prestigious of the annual awards is the Ballon d’Or trophy, awarded to the best male player of the year. The equivalent of an American “MVP” award, the Ballon d’Or was a French award until FIFA combined it with their Player of the Year Award in 2010, according to the official Ballon d’Or website. This year’s recipient of the “Golden Ball” was Argentinian attacker Lionel Messi, who narrowly beat out his F.C. Barcelona teammate Neymar and Real Madrid’s Christiano Ronaldo to win his 5th Ballon d’Or. 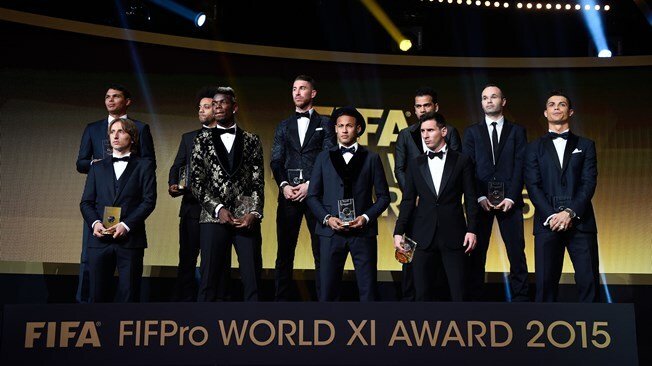 The three forwards that made this final shortlist for Ballon d’Or also made the FIFPro World XI, a list of the eleven best male players of the year. This year’s list also featured German goalkeeper Manuel Neuer, a predominately Brazilian set of defenders including PSG’s Thiago Silva, and a trio of midfielders headed by France and Juventus’s maverick box-to-box powerhouse Paul Pogba. 2015’s “teamsheet” was the first time that Neymar, Pogba, and Croatian playmaker Luka Modric made the esteemed list. Other players that were honored at the event included the Women’s World Player of the Year, Carli Lloyd. Lloyd led the U.S.A. national team during 2015’s World Cup in Canada, at which the Americans won the nation’s third ever world title. Lloyd, who plays at the club level for the Houston Dash, is an attack-minded midfielder who’s goal scoring tendencies shined on the international stage when she scored a hat-trick in the World Cup Finals against Japan. The Puskas Award, which is given to the scorer of the best goal of the year, was handed to Brazilian Wendell Lira for his bicycle-kick strike against Atletico-GO in March. His team, Goianesia, went on to win the state championship game due in part to the agile finish. Off the pitch, Luis Enrique and Jill Ellis won the Men’s Coach of the Year and Women’s Coach of the Year awards, respectively. Enrique’s Barcelona squad won their treble in 2015 and Ellis coached the U.S. to their first World Cup win in 16 years, according to the FIFA official website.